Giuseppe Del Giudice is the CEO of Real Potential business and inventor of the self-help device Wheel Potential an eight-time inventor award winner in USA, Croatia, and Thailand. Giuseppe has helped over 5000+ clients in the past 30 years lose weight, change careers, improve relationships and improve mental health and oversees the marketing and development of Wheel Potential. 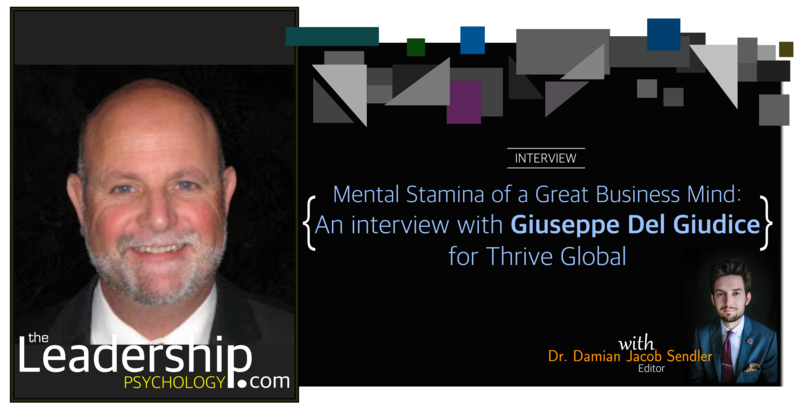 I had the pleasure of interviewing Life Coach/Behavior Specialist, Giuseppe Del Giudice CEO of Real Potential business and inventor of the self-help device Wheel Potential an eight-time inventor award winner in USA, Croatia, and Thailand. Giuseppe has helped over 5000+ clients in the past 30 years lose weight, change careers, improve relationships and improve mental health and oversees the marketing and development of Wheel Potential. Giuseppe is first generation American and raised Italian. His parents emigrated to America in 1954 to Ellis Island, NY. Giuseppe’s first language was Italian and at 18 he left home. Shortly after leaving home Giuseppe enlisted in the NAVY as a Hospital Corpsman-Medic for four years on the USS Constellation CV-64 aircraft carrier and Naval Hospital Great-Lakes, ILL. He graduated from the Naval Academy of Health Sciences and Liberty University with a Bachelor of Science in Psychology specializing in Life Coaching. Giuseppe had excellent role models…his family! First beginning with his parents which took tremendous courage to leave 14 brothers and sisters on both sides to emigrate to America with 3 small children. Then older brother who was first to go to college and oldest brother going into the ARMY during Vietnam. Giuseppe comes from a courageous family, living by the motto, “If You Want Something Go and Get It.” Giuseppe’s lives his core values every day; honesty, humor, integrity, and tenacity. I’m a blend of 60% extrovert and 40% introvert. In life in order to Be more, Do more and Have more you show-up and do what is necessary to accomplish your why. Which means you use extroversion to execute your actions and introversion to reflect on those actions. Because without feedback how do you know you are heading in the right direction for you. The main drivers, are my core values: Honesty, Humor, Integrity, and Tenacity. Being mentally strong is not about over-powering the people around you it is sticking to your BIG why and core values. Our core values keep us on the straight and narrow path with limited fluctuations. For me it comes down to being honest, having some humor, saying what you mean and mean what you say. Also using your BIG why to smash your own mental barriers, poo pooher’s and naysayers while keeping diplomatic behaviors. First, absolutes do not exist! Most things are based on opinions and expertise of opinions. What is mental health mean anyway? It’s subjective and is up for interpretation to the receiver. In my opinion it takes a tremendous amount of courage for a person to admit they need help with mental health. Mental strength means using diplomacy, listening skills, providing feedback when asked and leading by example. Mental stamina is knowing when you take time for balance and recharge your mind, body and inner-self. Either at work in a quiet place for 2-3 minutes, at home, nature or whatever helps the individual. Wow! I stand on the shoulder of giants! Abraham Lincoln, Benjamin Franklin, Leonardo Da Vinci, Michael Angelo, Marcus Aurelius, Buddha, Confucius, Socrates, Superman, Henry Ford, Thomas Edison, Dr Aaron Beck, Dr B.F. Skinner, Dr. Albert Ellis, Dr Ivan Misner, Dr Peter Drucker, Leo Buscaglia, Stephen Covey, Jack Canfield, Jim Rohn, my family, Captain America, Winston Churchill, Margaret Thatcher, King Arthur, Andrew Carnegie, Napoleon Hill, Dale Carnegie, Dr David Burns, Dr Mihaly Csikszentmihalyi, Dr Robert Cialdini, Dr Daniel Goleman, Ari Weinzweig, Ron Hubbard, Arnold Schwarzenegger, Franco Columbu, Warren Buffett, Dr Kathryn D Cramer, Michael Gerber, Dave Ramsey and Howard Lim to name a few. Read about these people and you will be rewarded with more wisdom. Also, being in nature is a good way to absorb their wisdom. Listen to the inner advice. Identify your core values, stay on the course to achieve goals, and use diplomacy to achieve success. What does it mean to be mentally-strong in the age of information and technology? Staying up to date with technology means stating relevant to the information age. When doing research check at least three different sources five is best. GIVE YOURSELF TIME AWAY FROM TECHNOLOGY. Too much tech leads to much brain-loss thinking energy-points. Can an imbalance in private life cause a mentally-strong leader to deviate away from the path of success? Why? How to alleviate this problem? Absolutely! Life begins at home and stems from there. Home is your center of the universe balance that and you will be in balance with Health, Wealth, Love and Fulfillment. What works best to maintain strong mental stamina as a leader? Yoga? Meditation? Listening to music? Something else? Wealth: Watch spending by keeping a daily journal on what you spent for the day. Review the journal at the end of the day, and adjust spending accordingly. Building a strong leadership position requires intense interaction with other people. These professional interactions can be both positive and negative, depending on the kinds of people we interact with to achieve our goals. What is the better choice to make to achieve greatness: learn to interact with toxic acquaintances to ‘get to the top,’ or choose to be a loner and do all the grunt work individually without dealing with the toxicity of others? First, you can’t make someone feel something they already feel which means the other person will be in a higher emotional level than the toxic person. The intense person will be watching the other person and feeding off their energy. Stay calm and listen until the person is completely done talking. Remember, you’re a diplomat! In 2019, what will be the best way to recharge energy? Have purpose, listen to yourself, take frequent mental breaks to regroup your thoughts, be and act diplomatic, be nice to yourself first, so you can be nice to others. How do you find your core values? First, create a list of all the important things in your life. Then rank them all, then put them in order, then split your list in half, then in half again and again until you get down to four. It will get more difficult as the list becomes smaller…keep going!